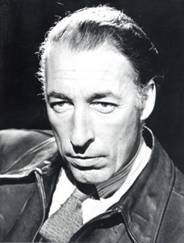 Louis MacNeice (1907-1963) was born in Belfast to a strictly Protestant father and a mother whose mental illness and premature death disturbed MacNeice for the rest of his life. These early years were recalled later as a time of darkness and loneliness and his suffering was only brought to an end when he was sent away to England for schooling, ultimately graduating from Oxford University having read Classics. Perhaps as a result of his strict and unhappy childhood, MacNeice's poetry has been described as "a reaction against darkness" and his love of light, of the variety and joy of life is encapsulated in his phrase "the drunkenness of things being various". However, the darkness that he was reacting against, whether it be memories from his own past or fears about the rise of totalitarianism and fascism in Europe during World War 2, remain in his work and is most clearly evident in his poem 'Prayer Before Birth', which was written at the height of the Second World War. In the poem MacNeice expresses his fear at what the world's tyranny can do to the innocence of a child. Although written at a particular historical moment, by making the speaker of the poem an unborn child MacNeice gives it a stark universality. The rhythmic build up to the final crescendo where the baby pleads for death makes the bluntness of the final line, and the implicit criticism of state of the world, even more shocking.